Between the mountains and the seas, there was a war with the beasts for survival. A man, named Bo Yi, discovered that drinking the beasts blood would grant him powers. Bo Yi traveled the world, recorded these beasts, and wrote the "Shan Hai Jing", he also established «Shang Hai Jing» city, to promote the idea of eating beasts to gain the power to hunt them. But when relations with other countries soured, Bo Yi had disappeared. Since then «Shan Hai Jing» started the pursuit of fame and profit. A young man is a slave at «Shan Hai Jing», however, he has an astonishing ability. The battle with the beasts changed the fate of both this young man and the entire world. WoW, this one art is phenomenal. Sometimes I thought I was seeing a US comic, others a manga, than I notice that I was reading a Wuxia Novel in bloom colors! LOL. Great work for the artist! Hope that next in line is DMWG, DT, LOAR, Eternal God Emperor. That would be awesome! Hope to see the end of this one! Continue the great work! Cheers from a new fan! 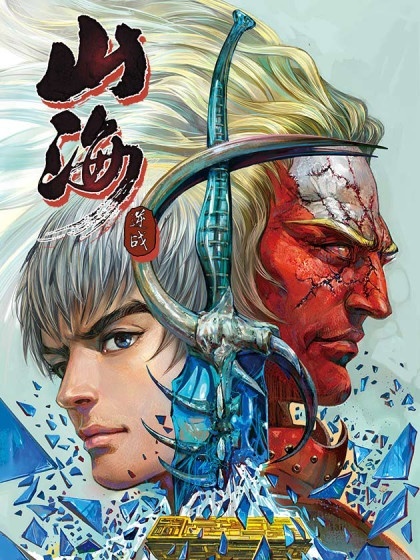 KingMast, should check out Heroes of Spring and Autumn and Feng Shen Ji. If you haven’t already read them. Art and colour styles are similar, very good.